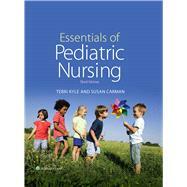 Essentials of Pediatric Nursing is intended for Pediatric Nursing courses with an integrated pediatric curriculum. It provides a unique concept-based approach and nursing process focus that helps students go from concept to application by building on previously mastered knowledge from other courses. The new edition of the text focuses on allowing students to apply concepts from the book to cases throughout the book. It also emphasizes developmental considerations and atraumatic care, illustrating the unique nature of a pediatric patient. Also new to this edition are highlighted sections, showing student’s key areas in the text that students commonly struggle with and real life critical thinking exercises. This edition will have a comprehensive supplements program to support faculty and student needs, in addition to a pediatric nursing videos series available on thePoint.